The Arameans, or Aramaeans (Aramaic: ܐܪ̈ܡܝܐ‎, ʼaramáyé), war an auncient Northwast Semitic Aramaic-speakin tribal confederacy wha emerged frae Sirie in the Late Bronze Age the region kent as Aram frae the 11t-8t centuries BC. 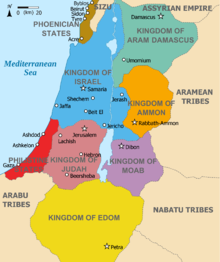 Thay established a patchwork o independent Aramaic kinricks in the Levant an seized lairge tracts o Mesopotamie. This page wis last eeditit on 3 Apryle 2017, at 02:39.